"I'm pleased to see the Phoenix Mayor and City Council respond to calls for action from members of the community who want to see street names reflect the city's commitment to inclusion and diversity. The current process does not provide a method to change offensive or derogatory street names that denigrate Phoenix's rich cultural and ethnic heritage. "The mayor and city council can and should update that policy as soon as possible. I am encouraged to see this issue on the meeting agenda for Tuesday and consider it an indication that city leaders recognize this as a priority. I urge all city council members to support this policy change. It's the right thing to do for our city." 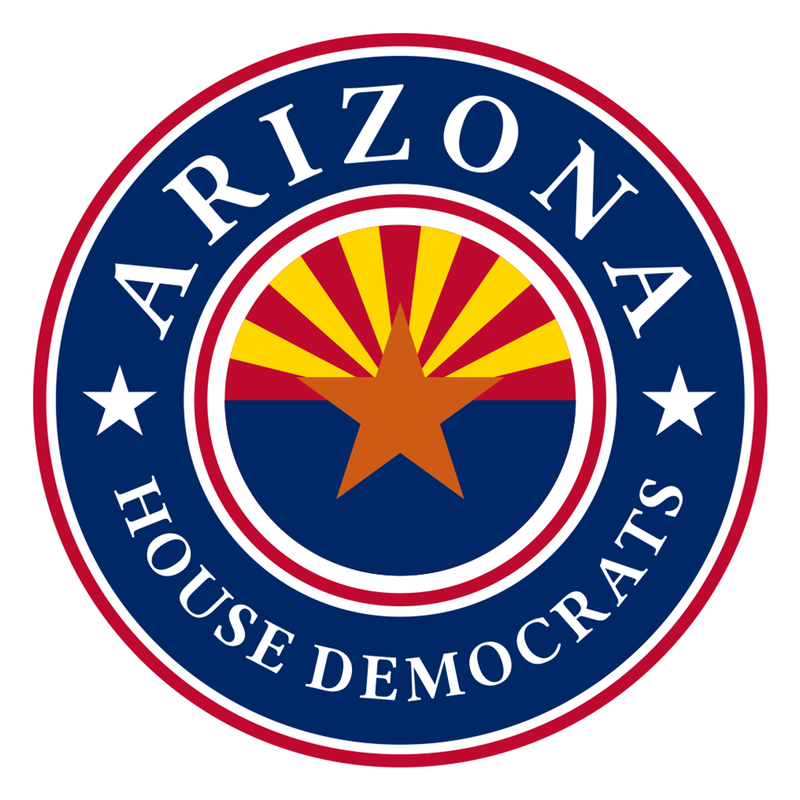 STATE CAPITOL, PHOENIX – Rep. Randy Friese, D-Tucson (District 9), delivered a letter to Gov. Doug Ducey, signed by 33 legislators, urging him to join the U.S. Climate Alliance and pledge Arizona's support for the Paris Climate Agreement. Friese's letter asked the governor to join a growing bipartisan group of mayors, governors, colleges, universities and business leaders from around the country who support climate action. The goal of U.S. Climate Alliance members is to uphold the objectives of the Paris Climate Agreement within their borders by reducing carbon dioxide emissions 26–28% from 2005 levels by 2025 and meeting or exceeding the targets of the federal Clean Power Plan, all of which President Trump has promised to undo. The alliance will also serve as a forum for sharing information and best practices and would allow Arizona to take advantage of the collective knowledge that other states have to offer. "As governor of the State of Arizona, Gov. Ducey has the power to send a strong signal that we will not be left behind. I strongly encourage him to join the U.S. Climate Alliance and commit Arizona as a global partner in the fight against climate change," said Friese. STATE CAPITOL, PHOENIX – Less than seven weeks after Texas Governor Greg Abbott signed SB 4 into law, the Arizona Latino Legislative Caucus will join the nation’s largest gathering of Latino policymakers for a discussion on next steps during the National Association of Latino Elected and Appointed Officials 34th Annual Conference in Dallas. The three-day event, which will take place June 22-24, 2017, at the Sheraton Dallas Hotel, will bring together the Arizona Latino Legislative Caucus with Texas lawmakers and colleagues from across the country as Latino policymakers join forces to strategize on how best to protect and support the immigrant community in the current political climate. “In Arizona, we know the fight Texas has on its hands. 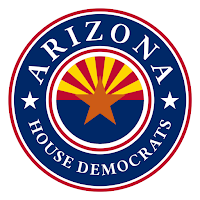 We have seen similar harmful legislation when Arizona enacted SB 1070, which was one of the most destructive pieces of legislation that oppressed an entire community and which had a devastating economic impact in Arizona," stated Rep. Diego Espinoza, D-Tolleson (District 19). "The Arizona Latino Legislative Caucus stands in solidarity with those who oppose SB 4 in Texas and look forward to joining colleagues in Texas to discuss a plan of action." On Saturday, June 24, Arizona Latino Legislative Caucus members will participate in a special plenary session devoted to the newly signed legislation entitled, “Supporting the Lone Star State Post SB 4: How Latino Leaders Can Unite to Combat Anti-Immigrant Laws and Practices.” This plenary session will explore how different communities are responding to this new paradigm and how lessons learned from California’s Proposition 187 and Arizona’s SB 1070 can be applied to best support the immigrant community today and to mobilize toward increased civic participation. Following the plenary session, Arizona Latino Legislative Latino Caucus members will join Latino policymakers from California, Texas and across the nation for three working group break-out sessions focused on key issues relating to SB 4 and other similar anti-immigration measures. The meetings will focus on policy and legal tools that Latino policymakers can use to support immigrants, strategies for ensuring the immigrant community knows its rights, and an examination of the negative impact these laws have on state and local economies. A number of Texas Latino elected officials who led the fight against the SB 4 legislation will be in attendance with the Arizona Latino Legislative Caucus during the three-day event, including NALEO President and Dallas County Treasurer Pauline Medrano, Texas State Senator and Texas Senate Hispanic Caucus Chair Sylvia R. Garcia, Texas State Representative and Mexican American Legislative Caucus Chairman Rafael Anchia, Texas State Representative Cesar Blanco, Texas State Representative Armando Walle, Harris County Sherriff Ed Gonzalez and Dallas County Sheriff Lupe Valdez. More information on the NALEO 34th Annual Conference can be found at www.naleo.org/dallas2017. 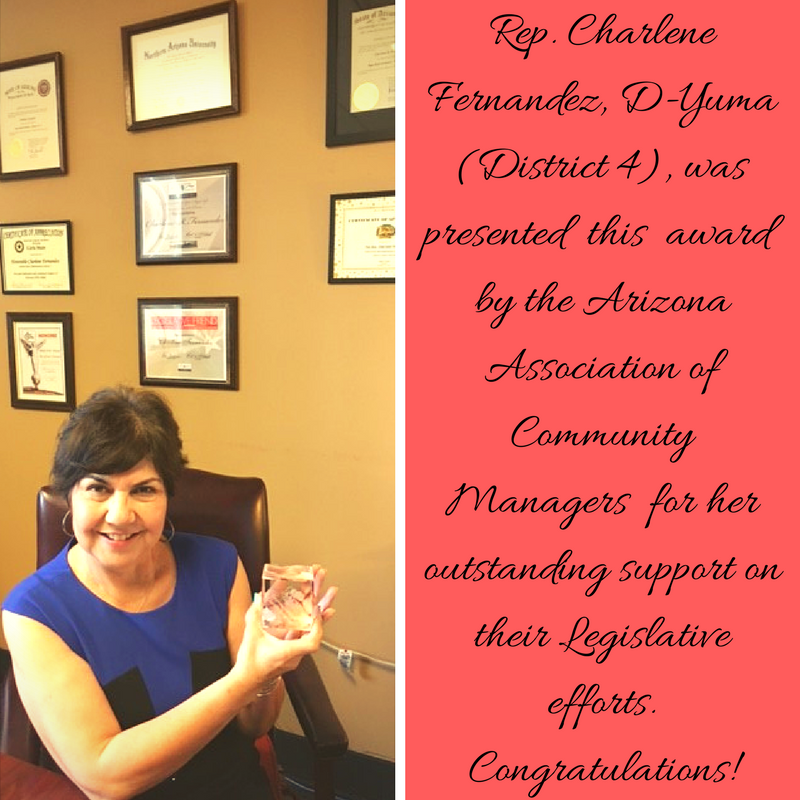 This past legislative session, Arizonans have been engaged in the political process and their efforts have not gone unnoticed. We saw the effects of citizen participation. Arizonans testified in committee, called their legislators and mobilized their communities by sharing their stories. If we are going to make Arizona stronger, we have to continue to organize, train, network and plan. That is what the We the People Summit is about. Rep. Ken Clark, D-Phoenix (District 24), is one of the event organizers. 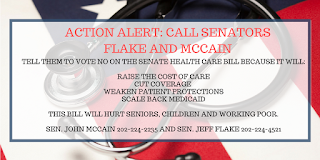 "Over the last few months, we have seen a political awakening in the state of Arizona. It has been inspiring and invigorating. 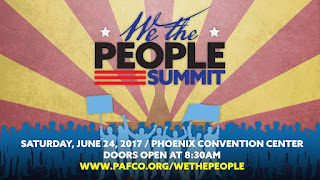 The We the People Summit series will focus that energy, educate individuals and empower organizations to take action. Please visit the website and take a look the workshops. Explore the issues and ideas that interest you, and join the conversation," Clark said. Your involvement in this process is vital to ensuring that your priorities for a better Arizona are being included. House Democrats want to guarantee that your voice is heard, which is why we need you to stay involved. Your voice matters, and it does make a difference. 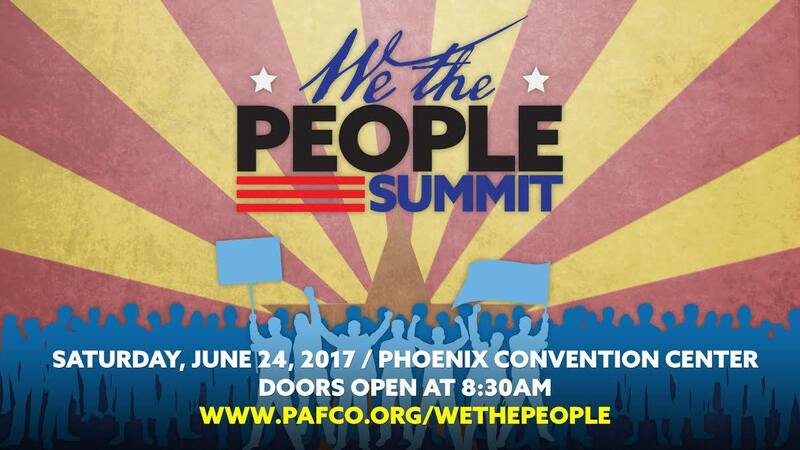 Click here to register for the We the People Summit. "The members of the Arizona Latino Legislative Caucus fully support removing or renaming Confederate monuments in our state. 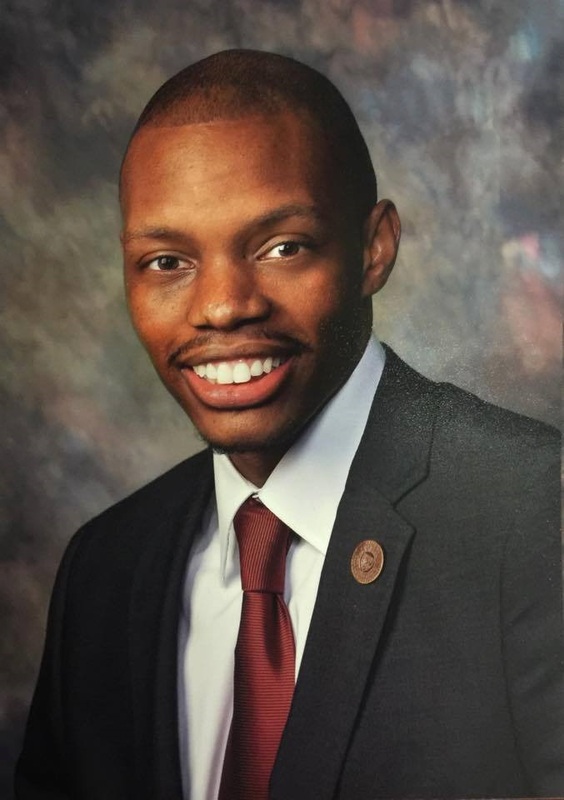 We stand with Representative Bolding and all the organizations calling for immediate action on this issue from Governor Ducey and the Arizona State Board on Geographic and Historic Names. "The implications of continued celebration of the Confederacy are shameful, and they affect all people of color. It's past time to put an end to this so we can build an inclusive future." State Legislators United for Climate Action will serve as a clearinghouse for state legislative solutions to uphold the Paris Climate Agreement and take more aggressive local action to reduce climate change. 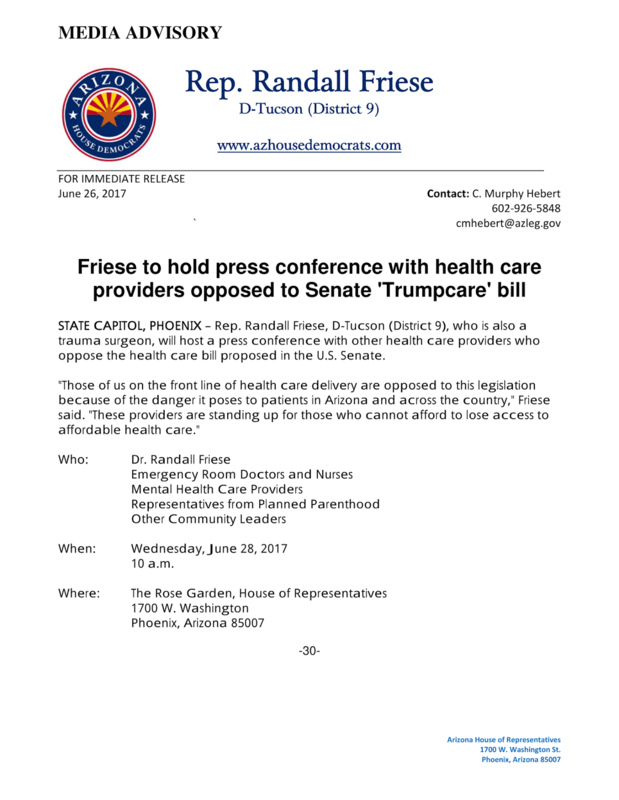 Tucson, Arizona – State Representative Randy Friese, M.D. today announced the formation of a working coalition to encourage state legislators to unite against climate change. “President Trump’s decision to withdraw the United States from the Paris Climate Change Accord is a complete abdication of responsibility and leadership,” said Representative Friese. Our members will be legislators who are firm in their support of the Paris Accord. The group’s mission will be to act as a clearinghouse of ideas to help legislators share solutions and gather the science available in order to draft and pass best-practices climate change legislation in their states. 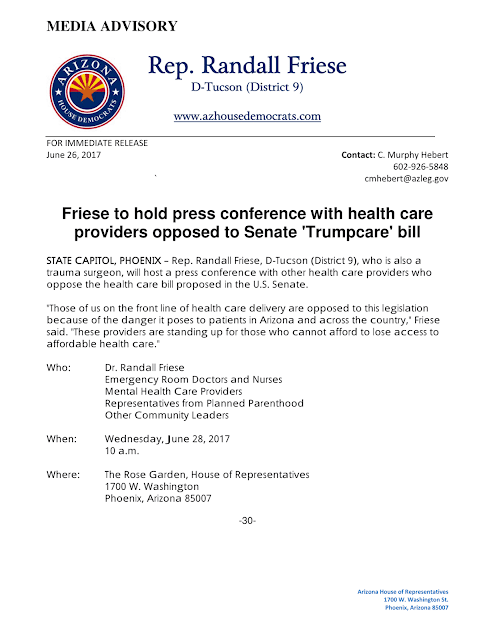 Joining Representative Friese in this coalition kickoff is Representative Becky Carney, N.C. General Assembly, Representative Pricey Harrison, N.C. General Assembly and Representative Kirsten Engel, Arizona State Legislature. The group is establishing a social media footprint with a current Facebook page (State Legislators United for Climate Action) and a website under construction, www.StateLegislatorsUnitedForClimateAction.org. Rep. Randy Friese, M.D. is a trauma surgeon at the University of Arizona and is the Assistant Democratic Leader in the Arizona State House of Representatives. Rep. Friese is also on the Board of Advisors for 314 Action, a national organization that is promoting evidence-based solutions to combat climate change and strengthen public health and education policy, and recruiting and training individuals with backgrounds in science, technology, engineering, and math to run for public office.